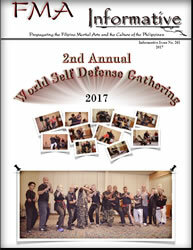 The 2nd Annual World Self Defense Gathering was held September 15, 16, and 17, held at the Metro Points Hotel, 8500 Annapolis Rd, New Carrolton MD. The FMA Informative is very thankful that Stephanie Medina provided the material and photos, of the event. Stephanie is the spouse of Grandmaster Dan Medina of Majapai Derobio Escrima who was an instructor at the event and it must be noted that Grandmaster Medina provided the photos for Sunday the 17th and gave Stephanie a blow by blow of what sounded like a great wrap up of this incredible event. The host of the event was Grandmaster Samuel Scott Founder of Full Circle Martial Arts and Real World Self Defense (fcmartialarts.com) and he created an atmosphere of genuine learning and good will. Attitudes and Egos were checked at the door and an impressive lineup of talented and highly respected men and women freely shared their arts and knowledge. This was an event that if you missed it you missed the chance to gain the skills and knowledge that was offered, not only in the Filipino martial arts, but also Shuri-Ryo Karatedo, Shurite Jo-Jutsu, Tae Kwon Do, Tai Chi, Sanucas Ryu Jujitsu, Sanuces Ryu Jiu-Jitsu, Tae Kwon Do, Tien Shan Pai Kung Fu, Western Boxing, Jeet Kune Do, Burmese Bando, Moo- Duk-Kwan, Tang-Soo-Do, and Kick Boxing. Again, each instructor at the event and guests which demonstrated at the event are top instructors in their art and if ever the chance to attend a seminar by them, most certainly do. You will not regret the knowledge that will be shared. Again the FMA Informative thanks Stephanie Medina for all that she contributed to this issue. Visit www.fmainformative.info (link is external) and download a copy.